Successfully Added Fingerprint Door Lock - Left (Emperor Grade Edition) to your Shopping Cart. Fingerprint Door Lock in an Emperor Grade limited edition. This model Finger print door lock has a unique Ancient Chinese design to make it both the most secure and best looking door lock system anyone has ever seen! An excellent home/office door lock that can be installed onto a brand new door or retrofitted onto an existing door, this Fingerprint Door Lock lets everyone know that you are serious about safety and security of your business. Easy DIY (do-it-yourself) installation is provided through a detailed and illustrated instruction manual, along with a door sketch map template to help you plot and measure the lock's optimal location. Registering and deleting fingerprints is just as easy and takes only a few seconds, which means minimal effort for maximum protection. In addition, this fingerprint door lock can fit into any door that is 35-80mm thick, and even includes 2 shim plates which allows installation on those extremely thin doors, so size really doesn't matter. 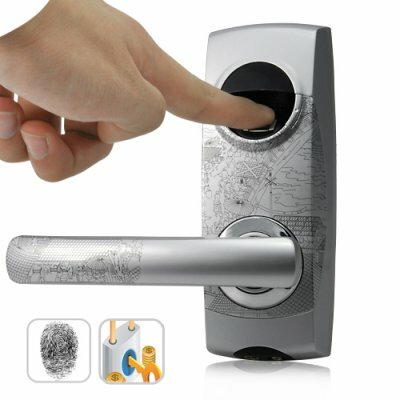 This fingerprint door lock features an On/Off button on the back: "Off" means it does not lock, so you can step outside for a moment and won't have to worry about swiping your finger or using your key - great for granting access to others for conferences and meetings at the office or for parties at home. Access can also be granted through advanced fingerprint recognition technology and 3 mechanical keys. Multiple forms of entry are available for convenience, but gain complete peace of mind knowing that they only work for those you give access to. In addition to total security, convenience and dependability, this high quality fingerprint door lock comes in a unique Ancient China design that will compliment any decor. This is also our most affordable one yet, so if you're looking for a chance to upgrade your door lock, you won't go wrong with Chinavasion's unbeatable factory-direct wholesale price and 12 month warranty. Order yours today and we will ship it out of our warehouse tomorrow! On the door handle. You can easily remove the cover to reveal the lock's key hole.